Business Insider highlights today the two main reasons why David Rosenberg, the chief economist and strategist at Gluskin Sheff and former Chief North American Economist at Bank of America Merrill Lynch, is bullish about gold. Gold is a hedge against financial instability and when the world is awash with over $200 trillion of household, corporate and government liabilities, deflation works against debt servicing capabilities and calls into question the integrity of the global financial system. Central banks, who were selling during the higher interest rate times of the 1980s and 1990s, are now reallocating their FX reserves towards gold, especially in Asia. With the gold mining stocks trading at near record-low valuations relative to the underlying commodity and the group is so out of favour right now. 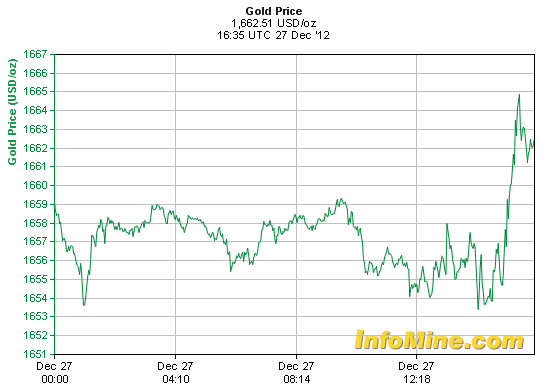 Gold dropped slightly on Thursday and was in sight of last week's four-month lows. Gold fell $4.58 an ounce to $1,654.91 by 6:00 am ET time. It has come off a 4-month low of $1,635.09 struck last Thursday, but remains below a record high of around $1,920 hit in September 2011. 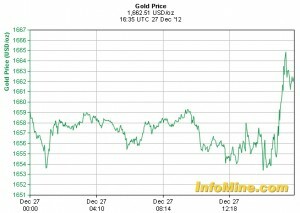 US gold for February fell 0.3% to $1,655.70 an ounce.